Boxing Day has non-definitive European Origins. Falling on the day after Christmas, it was the day to give gifts of goods and money to the servants and trades people in service to you and your family. During the time I lived in San Francisco and would religiously read the SF Chronicle/Examiner PINK section when everyone read hard copies of our Sunday periodicals, I remember reading something about how Boxing Day in modern Japan, if memory serves, had become something of an event for Spinsters. Yes, in some countries, if a young woman was not married off by the time she left her twenty-fifth year of life, she was negatively socially marked and branded as undesirable, a spinster. Following the social conventions and traditions of Debutantes, aka Debs, young women and their families endeavored to introduce her to the higher echelons of society and get her married while her pulchritude was at its peak, her maidenhood still intact, and her fertility was prime. Thank goodness, in 21st century world culture, we’ve had enough years and more than a few generations in place of women who have postponed marriage and childbearing until they have completed graduate studies and well-established a career. So, single women of all ages now have quite a number of options. Still, it is always a bit fun to take some older traditions which might be a bit out-dated and turn them on their heads, or even just twist and turn them sufficiently to give them a contemporary spin and modern edge to them. 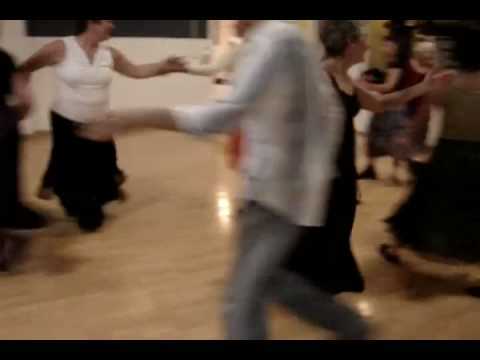 Contra Dancers, from the California Dance Coop website. So, if you’re single, why not head out and go to a Boxing Day Dance? If you’re in a couple, that same dance might be a good social endeavor for the two of you as well. The holidays have so many food festivities, that it’s a yummy season. However, we could all use a little more exercise with all of the extra holiday treats least we put on weight while celebrating the Thanksgiving Chanukah Christmas Kwanza holidays. Burp! It really seems to start at Halloween these days, doesn’t it? Couples need to feed new people, some newness and variety to their coupledom lives least they succumb to complacence, boredom, and a rut. When bored too often, that is when couples start to feel unhappy together. Feed the thriving love nature. Get out and dance. Burn a few calories, and learn some new steps while you’re at it! In SoCal, there is a Contra Dance on Boxing Day at Citrus College in Glendora from 4PM-7PM. Contra dance unlike many other styles of dance including Ballroom, Square Dancing, Tango, Swing, and Salsa, you can attend without already knowing the dance. Rank beginners welcome. DO show up by 30 minutes early before the dance because they will devote the first 20-30 minutes to demonstrating the basic contra steps to beginners. Then during the dance before a Contra tip, they will demonstrate maybe 1 or 2 steps that will be included in that dance right then, so you follow the group, participate, and keep up. If you didn’t come with a partner, don’t worry. Dancers in this dance culture endeavor to mix things up and change partners every Contra tip or so. Sponsored by Citrus College Fine and Performing Arts and CDC: the California Dance Coop. April Braswell is an expert columnist at DatingAdvice.com and speaks to singles in Singles Groups and Divorce Support Groups as well as at Singles Dating Workshops and Singles Conferences. Looking to Hire April to speak at your Singles Event, Women’s Group, or Business Group? I work for a ballroom dance company Arthur Murray in Sherman Oaks, Ca and I would love to see if we can work together to help singles meet other singles or just socialize. Looking at our clientele they are mainly all over 40 and either a long time or recently divorced or an older crowd that has lost their either half. They came to us looking for an outlet. A new hobby, something to get them out of the house and help them socialize. Dancing provides this in a natural way so everyone feels comfortable and changes their life in such a positive way. I’d love to speak to you to see how we can work together to help everyone single be ready to mingle.